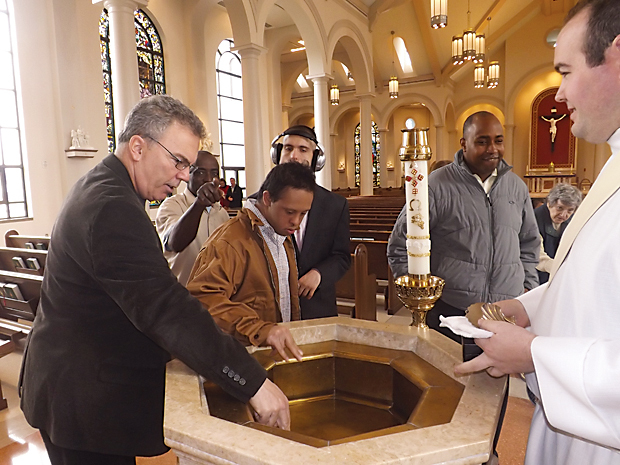 Kevin Barr (left), a Catholic Social Services official, shows the men of Don Guanella how to bless themselves with holy water in the baptismal font at St. Joseph Church in Downingtown, where their new community-based home is located. Residents of the Don Guanella group home in Downingtown pray the liturgy with St. Joseph’s parishioners during a recent Sunday morning Mass. It was the Sunday noon Mass at St. Joseph Church in Downingtown, and if some of the men in the front two pews seemed more restless than one usually expects to see during a liturgy, no one appeared to mind. These were men with various levels of intellectual disabilities who were former residents of Don Guanella Village in Springfield, and now living in group homes in St. Joseph’s Parish. Michael, a long-time former resident of Don Guanella Village, was visibly distressed. Sitting behind him, Elizabeth Kang, a St. Joseph parishioner, comforted him by gently stroking his back. From Kang’s point of view, Michael is an angel, with the grace of God flowing through him. The arrival of the Don Guanella residents in St. Joseph Parish is part of the ongoing dispersal of the 123 men at the Springfield facility mostly to small community-based houses in Chester and Delaware counties. The process that was first announced in January 2013 should be completed by the middle of next year, as more houses are obtained or erected at various sites. At the moment, there are two houses with a total of 10 men in residence and a third set to open with an additional six residents. The largest of the three, Broadview House, had its official blessing on April 28 by Father Dennis Weber, a member of the Servants of Charity, the congregation founded in 1908 by St. Luigi Guanella specifically to serve the poor and persons with disabilities. The Don Guanella system is operated by Catholic Social Services of the Archdiocese of Philadelphia. Prior to the Don Guanella men coming to the Downingtown houses, Kevin Barr, director of development and parish outreach for Don Guanella, and Father Weber spoke at parish Masses and gatherings, and an informational flyer was distributed explaining the history and mission of the program. 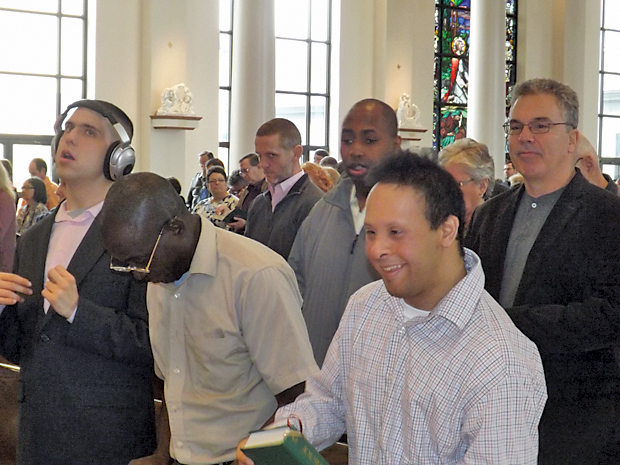 In addition to welcoming the men to the church liturgies, parishioners were invited to interact directly with these new neighbors, perhaps by helping with transportation to Mass and other parish activities, and assisting in the social life of the men. So far about 20 parishioners have come forward to assist in any way they can, according to Barr. Through the smaller group homes it is expected the residents will be more integrated and interactive in the mainstream community than would be possible in the larger facility in Springfield. Although the new houses have relatively fewer residents, they will still have the full staffing and services that were offered in the larger institution. Other group homes for the Don Guanella residents that are scheduled to open in the near future are in Our Lady of Perpetual Help Parish, Morton; Notre Dame de Lourdes Parish, Swarthmore and Our Lady of Charity Parish, Brookhaven. Don Guanella Village traces back to 1960, founded to provide residential care and training — to use the language of the day — for “mentally retarded boys and young men.” In today’s terms that would be “developmentally delayed adults and children,” except in Don Guanella’s case there are not at this time any young boys. Many of the original residents have aged in place and according to Francis Swiacki, who is director for the Developmental Division of Catholic Social Services, ages range from 20 to the late 70s. It is indicative of the ages of the residents that there have been 27 deaths among the residents in the last decade and five in the last year or so. The movement away from a central institutional complex to scattered group homes is in keeping with current norms of best practices for dependent care. When Don Guanella was founded its facilities featured four residents sharing a single sleeping room. That was state of the art and light years away from the huge dormitories of older institutions. Today, state guidelines suggest single occupancy or at most double occupancy is most desirable, and that is the standard the Don Guanella group homes will follow. If anything, the smaller group homes are more cost efficient than the larger institutions, and they actually feel like a home, based on the reactions of the men who have already relocated. At the time of the announcement that Don Guanella would move to mostly community-based group homes it was stated they would all be located, like the present facility, in Delaware County. This was reconsidered when the opportunity arose to open three homes in Chester County, especially because, checking the records, it was discovered that a number of residents had families living in Chester County, which would make it easier for families to visit men from that area. When all the residents and the administrative offices have moved from the Springfield property, it will be sold, according to the 2013 announcement. A mini campus will be established possibly at a Delaware County parish for the men who are too frail to be best served in a group home. Indirectly affected by these plans is the adjacent sister institution Divine Providence Village, a facility for developmentally disabled adolescent girls and women. There are no plans to close it but at some point some of the higher functioning women may also be relocated in community-based group homes, according to Swiacki. Whatever happens, Catholic identity will be preserved. “The mission of the church is one of twin pillars: faith and charity,” Swiacki said. For Patricia Menszak, who is the administrator of Don Guanella, the move has been an exciting time and if the initial homes are an indication, it really is a step forward. “The guys are flourishing in their new environment, both in the church community and the community at large,” she said. So far a local group, “Friends of Don Guanella,” has been established with local residents interacting with their new neighbors. Heretofore the Don Guanella men had sheltered workshop employment on the old campus. Now they participate in local programs in Chester County. However, Menszak noted, those men who will go to the various group homes that will open in Delaware County will go to a new work facility that will be opened in Our Lady of Fatima Parish, Secane. Msgr. 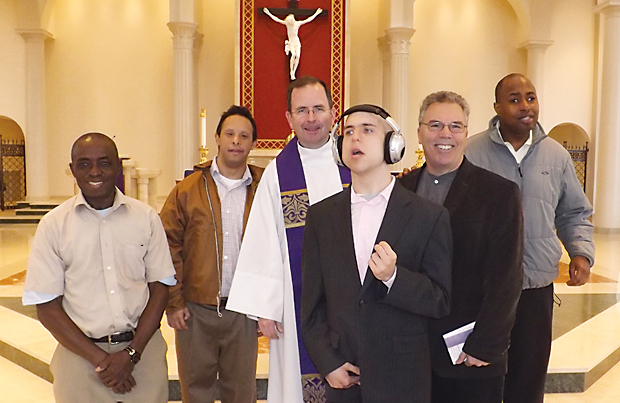 Joseph McLoone (center), pastor of St. Joseph Parish in Downingtown, welcomes his new parishioners. Why was the neighborhood not informed of our new neighbors? In speaking with other people living on Broadview East (as I do), my neighbors believe that 1302 is a “halfway house”. I think it would be nice to include the men’s new neighbors in an information session of some sort. If you don’t inform us of the truth, you will meet a lot of resistance among neighbors. Traffic in our quiet neighborhood has gotten out of hand and I am now afraid to let my children play outside (cars are flying up and down our street and there are always new strangers on what used to be a quiet, tightly knit street). Its a shame that this house is not being received well because of a lack of information.